It’s where Wales meets the world – with a slab of tasty Bara Brith. The traditional favourite helps give competitors a warm and authentic Welsh welcome when they arrive at the Llangollen International Musical Eisteddfod. They come from five continents to compete at the annual festival of singing and dancing. It’s a massive undertaking for the dedicated members of the Hospitality Committee who find accommodation for up to 2,000 people every year. The first port of call for overseas visitors is the welcome centre near the main entrance. There, the famished competitors, many of whom have travelled thousands of miles, can have a bite to eat and a cup of tea or coffee. This year Wales’s oldest family firm of bakers, Gerrards, who have a shop in Llangollen, stepped into the breach following a plea from Sandra Roberts, Chair of the Hospitality Committee. 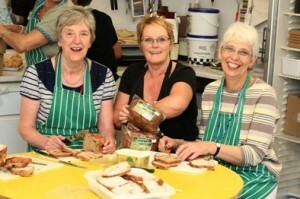 They have provided sponsorship in kind by supplying 1,200 sausage rolls, 130 loaves of their best-selling Snowdonia Recipe Bara Brith and 130 loaves of bread. According to Mrs Roberts, the Bara Brith is a particular favourite with the overseas competitors. That was backed up by 12-year old Lera Bagumian, a member of the Barvinochok troupe of singers and dancers from Kiev, in the Ukraine.